This is a one off "Purpleburst" finish MIJ '57 RI produced in 1983 (JV ST57-115). Just click on the above image to see several good close up pics of this guitar. 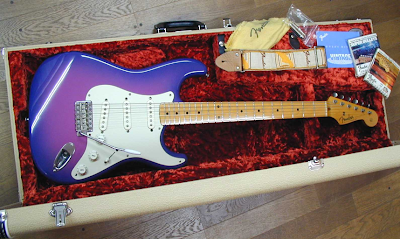 The Purpleburst is sold, but part of a very interesting & well photo documented archive at www.guitarsjapan.com , a Seattle based dealer specializing in a lot of early model MIJ & CIJ Fender guitars and some other cool lines too. Go check 'em out for some real finds!! !